Just when you are trying all your might to get rid of those ugly wrinkles on your face, wrinkly dogs seems to revel and love the attention they get because of their wrinkles. These pups have very adorable wrinkly skin that only further increase their cuteness quotient and make many dog lovers and fans go crazy over them. Many of these wrinkly dog breeds are also brachycephalic breeds, which mean they have flat face and short head. 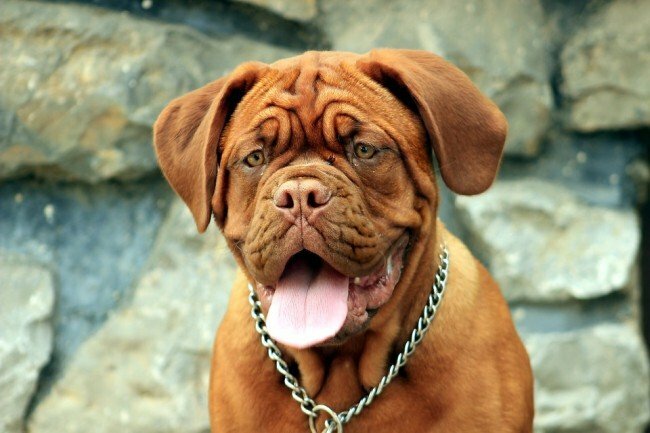 ​If you dream of owning a wrinkly dogs, here are some of the most popular breeds you can consider. Without a doubt, the Chinese Shar Pei takes the first spot in any list of the wrinkly canine breeds. Aside from having the most wrinkles, what makes them even more charming is the fact that they carry their wrinkles with utmost pride. The Chinese Shar Pei is a small and dog-shaped bear. Anyone who has ever laid eyes on a Shar Pei pup without being swayed by their cuddly and tender look doesn’t have a heart. 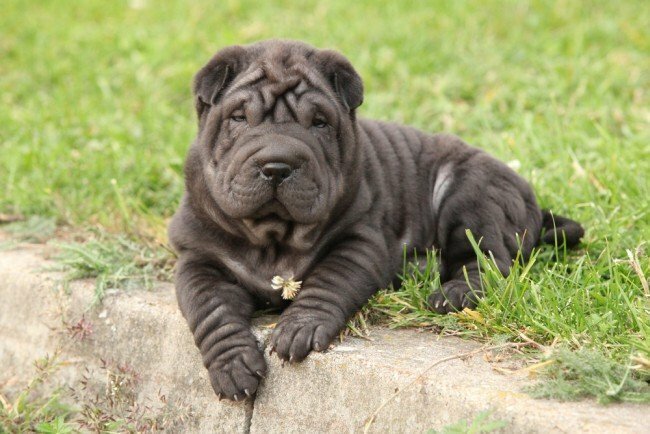 This is mainly because Shar Pei puppies have more wrinkles than adult ones. If you already have one or you are thinking about adding one to your furry family, the best gift you can give yourself is taking as many pictures of a baby Shar Pei as you can. These Chinese doggies are also very serious, loving, and loyal. If you wish to hold this furry friend in your arms all the time, it is recommended that you train your pet from a very young age. This is because these canines respect and appreciate their personal space. But, in spite of their gentle and docile appearance, don’t be surprised if your Shar Pei becomes very protective. They also need specific care since their skin is extremely delicate and is prone to bacteria. This is because moisture tends to accumulate in the areas in between their wrinkles. The Chinese Shar Pei is renowned worldwide for their expressive faces and superb wrinkles and their wonderful tongues of blue-black color. These adorable-looking puppies can grow into magnificent-looking adults. Despite their goofy outside appearance, these canines are seriously loyal, making them super guard dogs. It is why it is a must for this breed to be well trained and socialized at an early age for them to distinguish friends from foes and right from wrong. 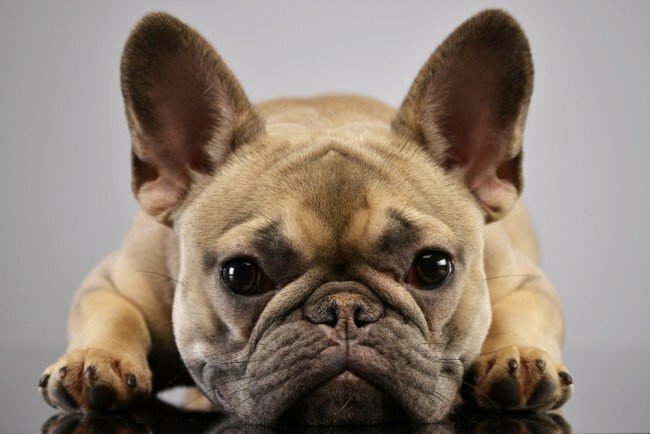 The French Bulldogs are known for their endearing appearance, with the wrinkly faces and bat-like ears. 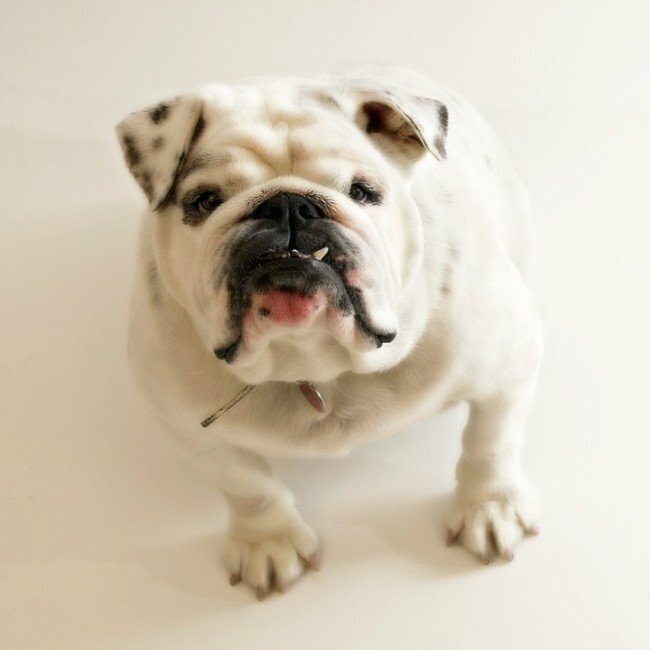 The French and English Bulldog alike are in demand companions for many city dwellers since they require less exercise compared to other breeds due to being brachycephalic canines. But, it is important to keep a keen eye on the weight of these pups as they have the tendency to pile on excess pounds when they are allowed to turn into certified couch potatoes. The French Bulldog has been enjoy a steady rising popularity for the past few years. It is mainly because of the increasing number of celebrity owners of Frenchies as well as photo-based social networks like Instagram where these doggies turn into celebrities in their own bragging rights. 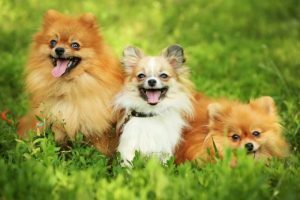 With their tiny legs, adorable pudgy faces, and big eyes, it is not a surprise that these tiny canines are very popular pets. But, if you plan to own a Frenchie, you must be well-informed on how to care for one properly. This breed has several unique needs you have to meet to make sure that they get to enjoy the highest life quality. Gunk and dirt can accumulate in between their wrinkles if you don’t care for them the right away. Bacteria can grow as well in this spot when excessive moisture is trapped in there. You have probably seen a Bloodhound in films where they help the police. Whether it is looking for a hiding criminal or in search and rescue missions, this gentle giant is often chosen. And as expected, there is a good reason behind this. Bloodhounds are well-known for their very striking appearance with the furrowed brow, sunken eyes, and the loose and at times slobbery jowls. It is definitely hard not to fall in love with them. While there might be other impressive canines out there, you can never find something softer or more endearing than Bloodhounds. But, make sure that you avoid being around these pups when they shake their after they eat or drink as it is better off for them to do it outside in the wide open space of your yard. The Bloodhounds are also notable for their phenomenal sense of smell. They find it easy to pick up any trail then follow it. Since they are very determined to find what they are searching for, they are the perfect companion of law enforcers. However, this is not the sole job they do in this society. 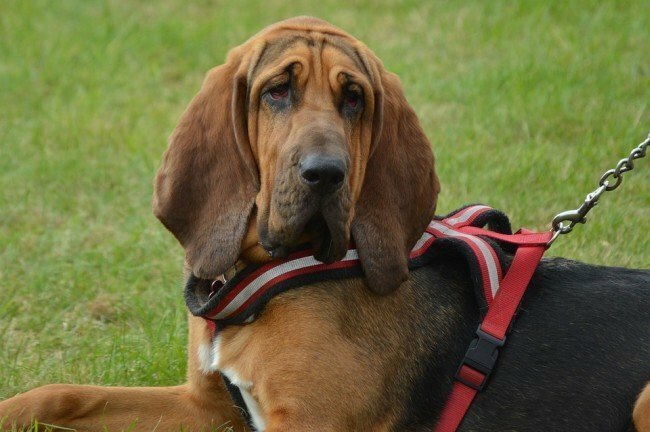 Bloodhounds are also amazing company animals for a suitable owner. They are the happiest when they can chase small prey and roam free in an expansive fenced estate. Pug takes the biscuit as far as cute is concerned. They have amusing scrunched up foreheads and faces that make them look like they are very worried tiny canines. But, for all you know, these funny looking small wrinkly dogs might just be laughing their heads off at you. 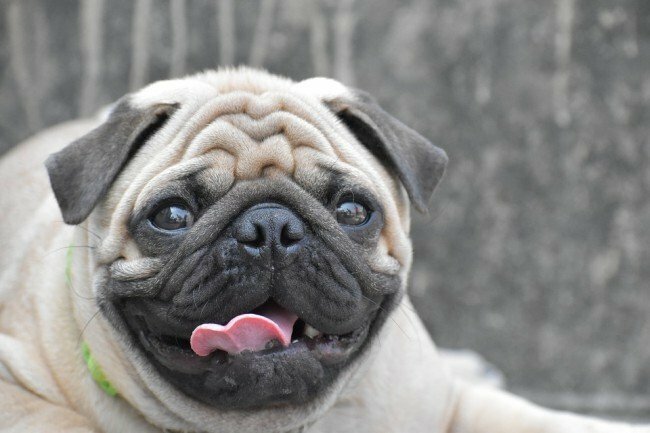 Pugs are popular options for people living in apartments since they cannot handle lots of exercise because of their flat faces’ shape. Similar to the English and French Bulldogs, Pugs are brachycephalic canines. In turn, it means that owners should keep a close eye on the diet and weight of their pet throughout their lives. If you carefully look after the special needs of Pugs, caring for them is very easy. Their short coat sheds yet they have modest grooming requirements. Due to their big love for people, you also have to be careful in getting your Pug used to being alone so that he will not develop too much anxiety if left behind. As far as large wrinkly dogs are concerned, nothing gets much bigger than the regal Neapolitan Mastiff known for their wonderfully wrinkled bodies and heads. A Neapolitan Mastiff weighs up to 150 pounds and they are also certified droolers, especially when they are done attacking their water bowls. But, the breed is a true gentle giant and provided that it is well trained and socialized while still young, the Neapolitan Mastiff can make a great family pet and loyal companion. However, they might not be the perfect choice for families who live in apartments or towns. 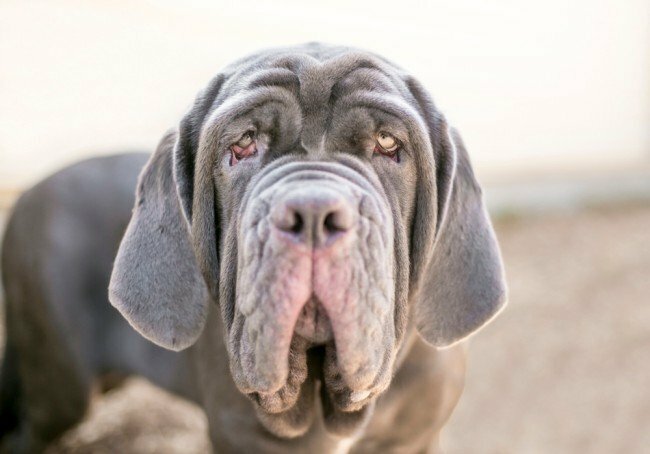 In spite of their intimidating looks, the Neapolitan Mastiff is a calm, loving, and affectionate wrinkly dog that is naturally protective and smart. They don’t tend to bark and are also protective and wary around strangers. The Neapolitan Mastiff must be socialized and trained as early as 4 months old. After all, it is impossible to try teaching a big adult mastiff some basic commands when it already weighs 165 pounds. You can also get better results when you train your pet at a younger age instead of correcting or instilling behaviors later on. You must introduce Neapolitan Mastiff properly to some pets. 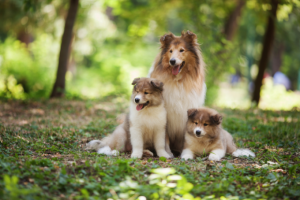 Without socialization or training, these dogs can be destructive or aggressive. Majority of people have seen a film called Turner and Hooch that starred Tom Hanks who fell in love with wrinkled, slobbery massive dog. Full of wrinkles, it’s one of the breed of dogs that has full of personality. These dogs are handsome, yet they can also be willful. IT means that Dogue de Bordeaux requires a gentle and firm hand during their socialization and training and they could get better of you. Dogue de Bordeaux is a powerful, immense mastiff-kind guardian. Males may go 27” high and 110 lbs. The eye-catching and short coat of this dog is a fawn rich in colors. Its massive features undershot jaw that is Bulldog-like, deeply furrowed brow, and expressive eyes. It has the biggest head in the kingdom of canine. Its body is close to the ground and stocky. However, Dogue de Bordeaux can move like the lions do once duty calls. Dogue de Bordeaux are sensitive and sweet souls. 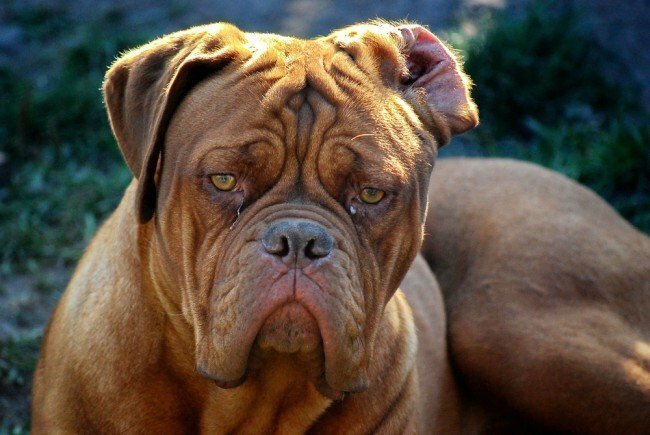 Owners love the loyalty of these dogs to their loved ones, but they also said that Dogue de Bordeaux can be stubborn and dominate who fail to apply a firm training. 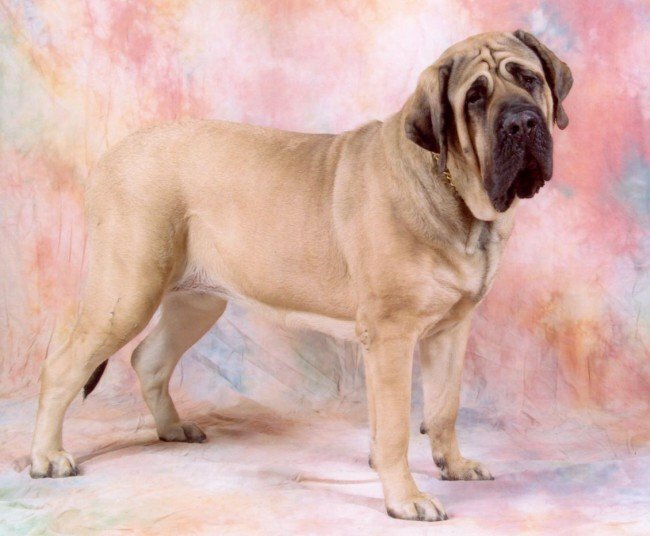 With the wrinkled foreheads of the magnificent Mastiff, some would think that it’s aggressive. But, the truth is that Mastiff is actually a gentle giant. These dogs are known for their slobbers, yet they’re also very loving and loyal personalities that would win your heart instantly. Nevertheless, these are powerful dogs and they should be well-trained as well as socialized at a young age if you want to make them a well-balanced dog once they become adults. In terms of weight, they weigh more than their masters once they mature. You can’t resist with Bulldogs. Their undershot jaws and cute wrinkles are just some of the charming characteristics that would win you over always. There is something personable with these dogs. That is the reason why these are one of the favorite companion dogs for families. Bred from Bulldogs and Mastiffs that accounts for their wrinkled looks, Bullmastiffs are big guard dogs that are known for tracking quietly and covering short distance easily. Many gamekeepers bred Bullmastiffs to catch poachers without causing any harm. Such dogs are docile, obedient, and fearless. However, they can be tough to train. Also renowned as a gentle giant, the golden rule that you should take note is that the bigger the dog breed, the better temperament and more friendly. If Bullmastiffs are brought up in a proper way, these won’t be a threat to their family or human companion. As a matter of fact, they will be the best friend you could wish for and best guard dog. The only thing you should do is to be careful since they do not control their strength and weight and might be a little rough when playing. Their wrinkles are on their neck and face that softens the daunting and strong presence. 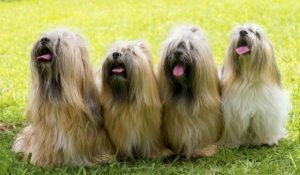 These are renowned as lion dogs and an ancient toy dog in China. 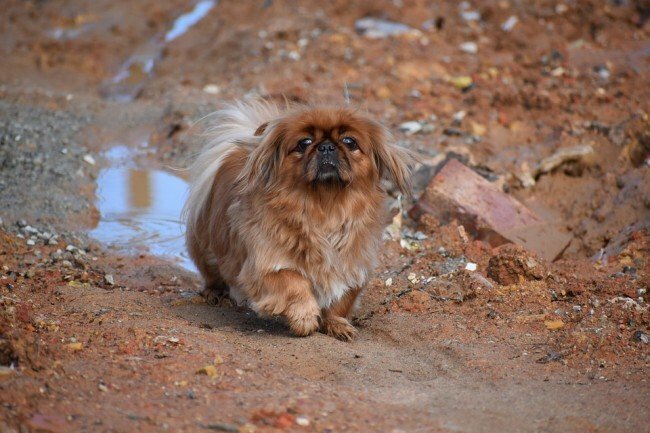 Pekingese is noted for its deep wrinkles on the face and flat muzzle. It has long undercoats that need lots of grooming. These are the bred for Chinese royalties and treated with good care. Stealing one of these dogs might earn you death sentence in the past. Even if affectionate, these lap dogs have self importance and regal dignity. Also, they are hard to housebreak. Itching – Wrinkled skin of wrinkly dogs might get very itchy, particularly once not kept dry and clean. The dogs could try scratching the itch through pawing or biting at their skin and rubbing their faces along the carpets that could cause abrasions and cuts. 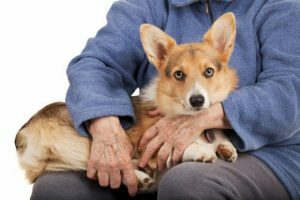 Irritation – The irritated skin that could appear inflamed, bumpy, and red may happen once dirt particles or food bits get caught in dog’s wrinkles. It could also indicate that dogs have an infection. Odor – If food or dirt is not cleaned out, your dog could get stinky. Bacterial or yeast infections that have the tendency to grow in wrinkly skin could smell bad. Once you notice any of such problems, you may ask your vet for the best advice. Your dog might just require having wrinkles cleaned out, yet such signs may also indicate infections or another skin problems that require treatments. 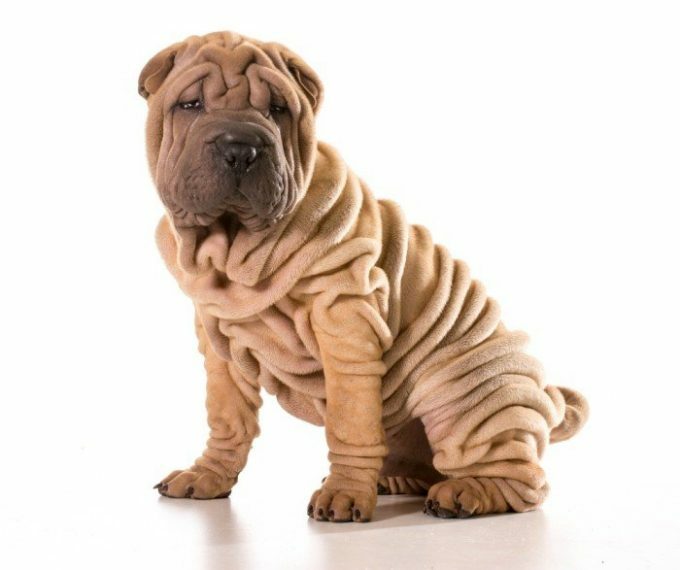 When it comes to wrinkly dogs, how can you avoid skin problems? The key is ensuring that their wrinkles are dry and clean. Ask your vet for a good skincare routine right for your pet, yet most would require regular bathing and daily cleanup. ​Canine Wipes – You may purchase these special wipes at pet supply stores. These are designed for dogs and very gentle. ​Baby Wipes – Hypoallergenic and alcohol-free wipes are made for the sensitive skin of babies, making them a great choice for dogs. They are easy to dispense and convenient. ​Q-Tips – These are not a good choice to do all-over cleaning. However, these can help you get rid of the stubborn dirt in wrinkles. Just be gentle and careful if you’re using Q-tips since it could injure the skin. Sterile Gauze – These are the same ones you keep in your own first aid kits, which can be used for cleaning wrinkles. 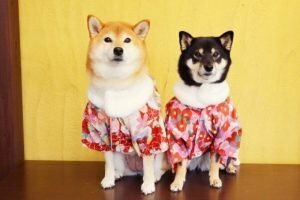 Cotton Balls – They are not only helpful in removing nail polish and makeup, but also these are multipurpose, which can help you clean the wrinkles of your dogs. To do cleaning, separate every fold in a gentle manner. Check if there are some skin problems. Clean out any food or dirt with swiping motion. Do as numerous swipes as it takes for cleaning the area, yet make sure not to cause irritations. When it is clean, see to it that it is also dry. You may move to the next wrinkle after that. ​Aside from daily care, you must give your wrinkly dogs a bath as often as every 1-4 weeks. Your vet could tell you how long you must wait between baths for dogs. You do not like to over bathe your dog as it can cause drier skin. 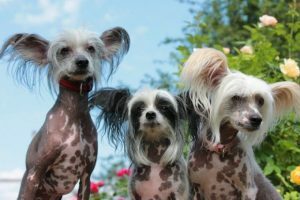 Pick a dog shampoo that is gentle and better for wrinkly skin because it can be sensitive to some fragrances and harsh soap. Ask your groomer or vet if you require assistance when selecting products that would work great for your dog. Wrinkly dogs are very adorable looking. However, they need extra care for the reason that their wrinkles and folds do need to be wiped and cleaned regularly with the use of gentle baby products to avoid debris or dirt getting lodged in them as well as causing irritation. It includes cleaning their scrunched up faces carefully, all wrinkles found on their adorable bodies, and their beautiful furrowed brows.